Commission me to create a memorable piece of personal artwork form your objects. 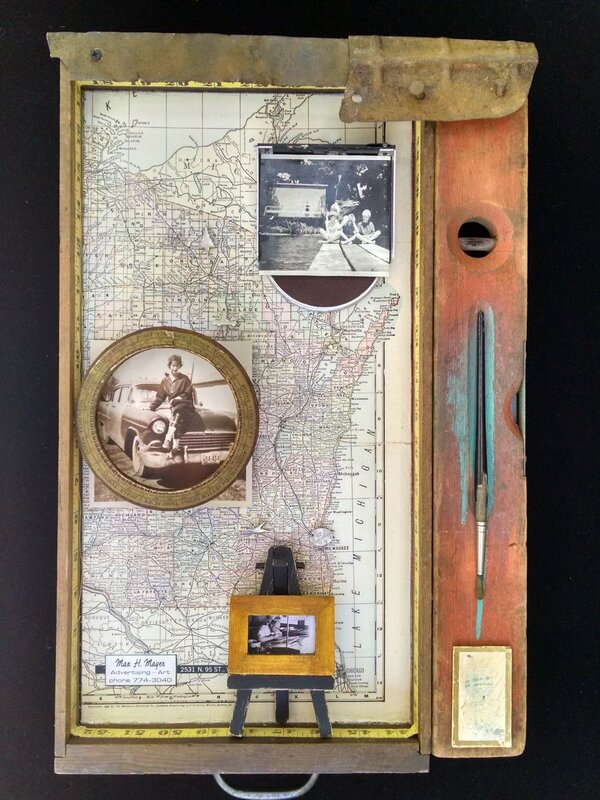 I use personal or family momentos to create an original piece of assemblage art. The example on the left used an old map of Wisconsin (their home state), copies of personal photos, objects from the client and added elements from my own collection to round in out. Creating a beautifully composed narrative about their family history including professions (artist), homes (pinned locations on map), vacations (photos and location) and hobbies (measuring tape inside box. Can be mail-ordered or hand delivered in the San Francisco Bay Area. Payment is due prior to construction. All pieces may not be used depending on composition and size restrictions. Price varies with size of piece. Contact me and create your one of a kind piece!